4am and our alarm clock went off. Great! That went down well with our hangovers as we quickly packed the final few bits and made our way down to reception to check out and get a taxi. Except no one was about, but as we chatted about what to do, a voice popped up from behind the reception desk and a young lad who had obviously been on the floor sleeping, popped his head up and said Good Morning. After telling him we were checking out, he remembered the call we made to reception last night to advise them of our early check out, and he called someone to bring our breakfast boxes down to us and called us a taxi. The taxi arrived before the breakfast boxes, probably the guy who was to make them was sleeping too. Anyway we got to the station on time, and the ticket counter was closed. There was a girl sleeping behind the desk on the floor (bit of a theme occurring here for nightshift workers), and a short while later she awoke as we went to speak to her to get our tickets printed off that I had bought online. Our train rolled in 10-15 minutes late (it comes all the way from Saigon), and after finding our way into a half-lit carriage, we struggled to find where our seats were. A local helped by pointing to two seats facing the opposite direction of travel, which is not what I booked, but we sat down and got comfy as possible for the 12-hour journey ahead. The journey was boring to be honest, some areas had nice views, but it was mainly just flat farmlands with the occasional small town. We had demolished our breakfast boxes within the first couple of hours, which were decent enough and included some bread rolls, cheese, cold meat, pastries, mixed fruit and a yoghurt. 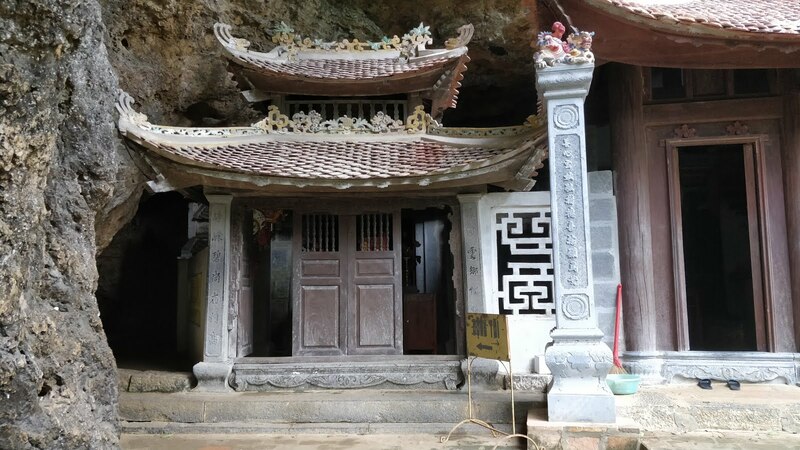 On arrival at Ninh Binh, the usual taxi touts were out in force, and at one point we had 3 of them following us out to try to get them in the car, not sure if there was a mis-communication or not but when we got into one of the cars, the other 2 drivers didn’t seem happy. 10 minutes later, we arrive at our accommodation in Tam Coc, which is a sleepy little town and where most people base themselves for this area. The place was called Tam Coc Tropical Homestay, which to be honest the only thing that was tropical here was to be the rain for the next few days! We were in a cottage, one of about 8 in a small courtyard garden, and was nice enough for the price. Breakfast was included but was very basic, which consisted of a fried egg (1) and a baguette which they call Banh Mi over here, a fruit juice and some fruit, no coffee! Thankfully by the 3rd morning, they changed it and we got a pancake instead! By the time we got settled in, we were starving so headed out to the nearest half decent place we could find. 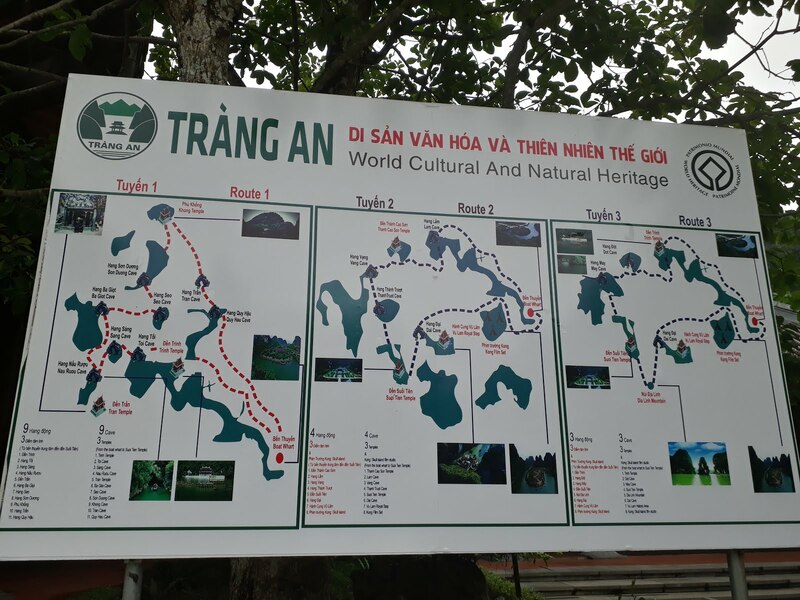 Tam Coc is just full of tourist agencies, homestays and restaurants. 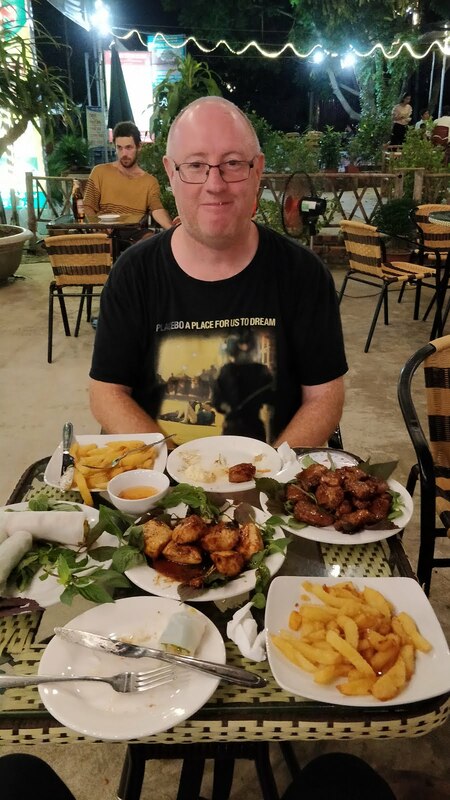 We found one called Linh Chi Family Restaurant, and ordered some Fresh Spring Rolls, Chicken in Honey, Roast Pork and some rice. Firstly, the spring rolls came out, twice the size of the usual you get and what was shown in the menu, but then the 2 meat dishes came out, and were both the biggest plates of meat I’ve seen in a long time. Well just as well we were starving, and we still struggled to finish it. As it was so delicious, we ate there a couple of times over the few days there too and popped in for beers as they were the cheapest at 15k a bottle (50p). 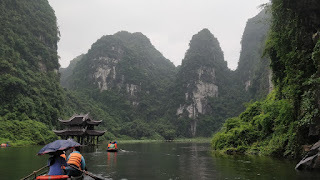 The weather forecast for the next few days was grim, and we had a few things we wanted to do here which were a boat trip through the limestone karsks, visit a couple of temples and see a few other local points of interest. 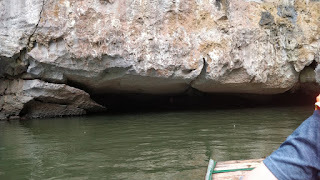 The weather for the following day seemed to be the best, so we booked a taxi to take us to Trang An, which apparently is a better boat trip than the local one in this town. We got dropped off and the taxi would wait for us there, and then take us to the Bai Dinh Temple after the 3-hour boat trip. On getting our tickets, we were told the longest route was unavailable this day due to water levels being too high to get through some of the caves, but we would still get a good look round and see a few caves and temples. 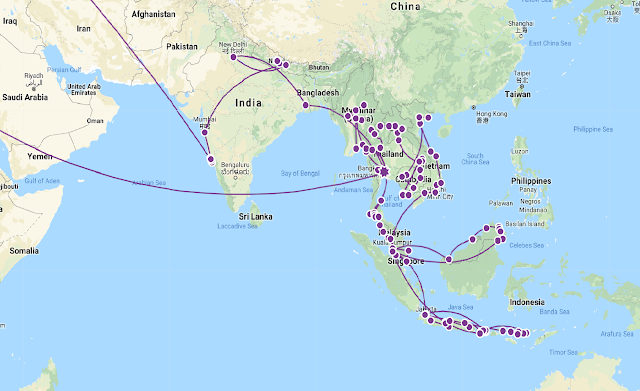 And as we would find out later, this obviously can affect any of the set routes they do fairly regular. It’s meant to be 4 people per boat, so we had to sit and wait for a bit for another couple, but the lady in charge just put us in with a lone Japanese man, so we all got into this little metal boat and our boat lady got us on our way. We were soon drifting down the river with these amazing views of the karsts all around us, with greenery and the bare limestone intermingling together, it really was something special. 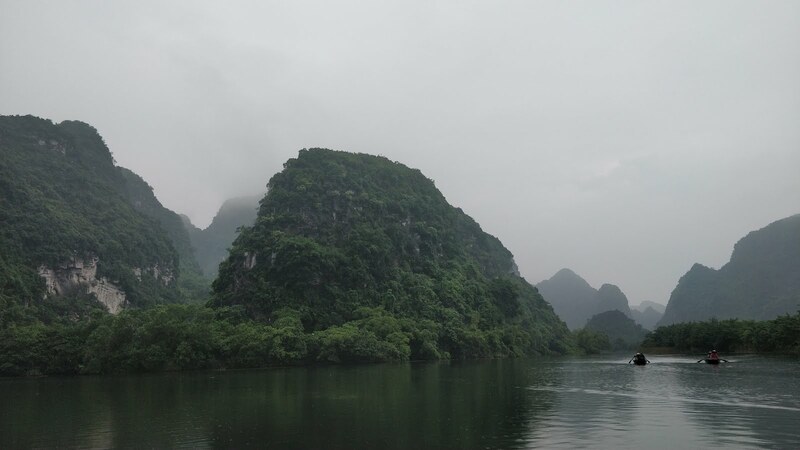 Many people call this the Halong Bay on land, and we could see why! 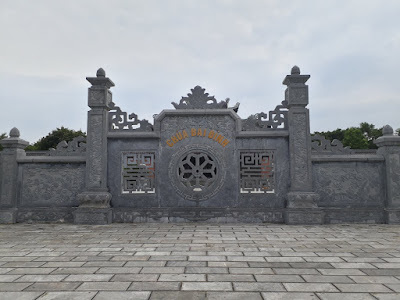 We stopped off a couple of times on the way round to visit some temples and one of the sets used in King Kong: Skull Island, though that wasn’t a highlight, the scenery spoke for itself as will the photos linked below. 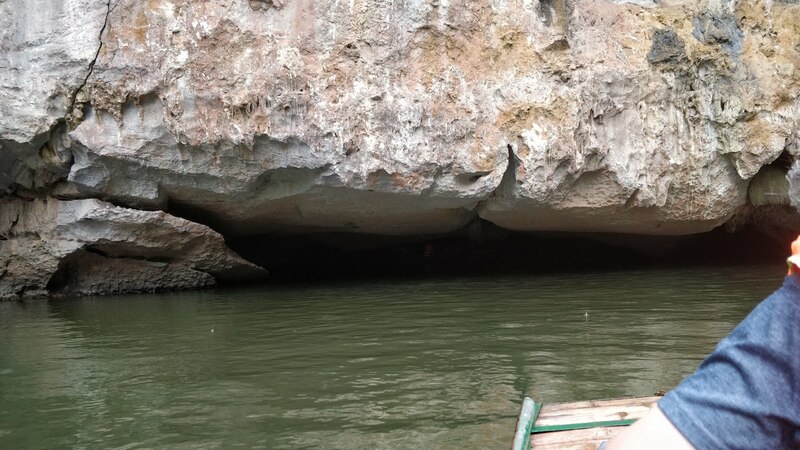 We also went through a couple of caves which cut through the limestone rock, which were low and at one point we had to get off the bench seat and sit on the floor to avoid the huge rocks above our heads, although it was amazing fun! After approx. 3 hours going around a huge loop, we ended back at the starting point and we got back into our awaiting taxi to take us to the Bai Dinh Temple, which is one of the largest temple complexes in South East Asia. 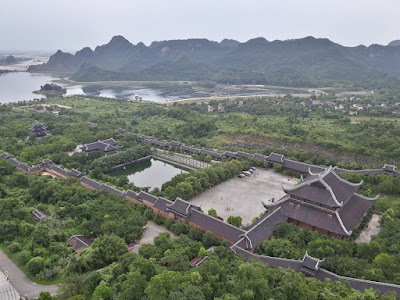 We got dropped off in the car park, and could see one part of this complex, a huge 13 level pagoda away in the distance. We were wondering how far it was to walk there, as by this time the midday sun was beating down, but luckily, they have electric golf buggies to take you to the start of the complex and then you can walk up through it all. On getting our return tickets for 60k each (£2), we jumped into an awaiting one and off we sped for what seemed like ages to the gates. There was a covered walkway up either side of the central gardens area, with various temples, great halls and a huge bell tower to explore on the way up. 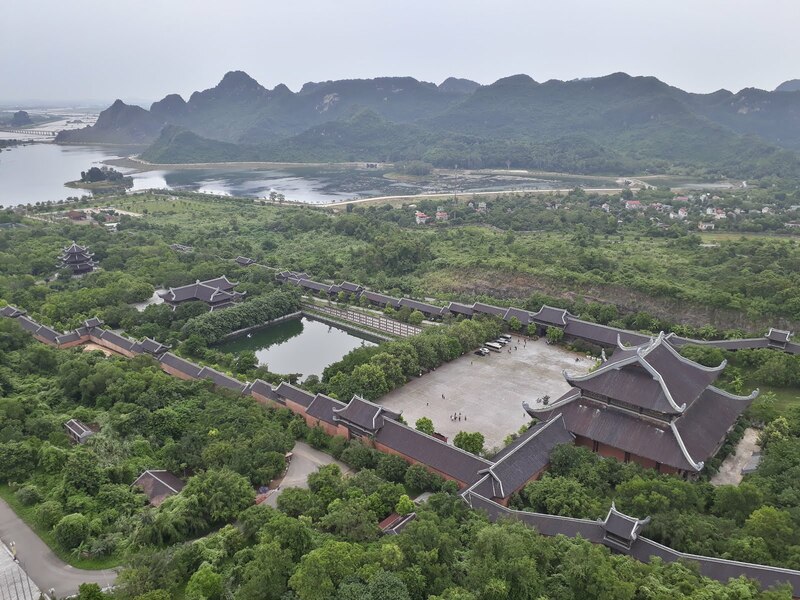 We got to the end and decided to pay the small fee to go up in the lift up the pagoda tower, which was well worth it as it had an amazing gold stupa at the top plus you had amazing views from all over the complex plus the karsts in the distance. By now we had been here about 2 hours, and so headed back down to the car park to get our taxi back to the homestay. The following day it was meant to rain all day, but in the morning, it was dry, so we decided to walk the 35 mins or so to the Bich Dong Pagoda, which is on the side of a hill and is on 3 levels. It was quite nice to climb up through a cave and up to the top, and when we got down again Sadie wanted to explore another path she saw from there, and I went to grab what was probably the worst coffee I’ve had at some little roadside café. Just as we started walking back, the heavens opened, and we got soaked through and stopped for an egg coffee to seek shelter near our place. Early afternoon, it continued to rain quite heavily, so decided to stay in and catch up on the photos and blog and went for a Banh Mi for lunch, which was sadly disappointing and so for dinner we had already decided to go back to the first place we went to, and again got mountains of food on our plates! 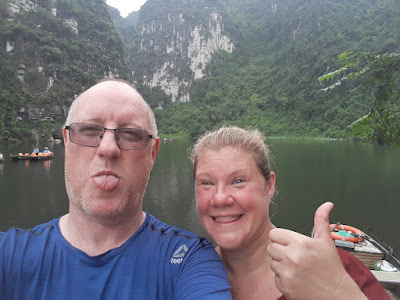 By our last day in Tam Coc, we had already seen most of what we wanted to in the area, and with it raining again in the morning, we had a lazy one in the room and got our haircuts done and a bit more research on Hanoi and Halong Bay. 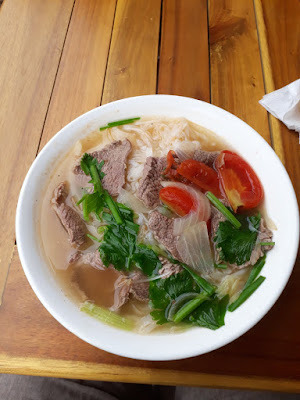 The rain had stopped by lunchtime, so off out we went for a walk to track down a better Banh Mi and we managed to find a place that did a great one, plus I had my first Pho Bo, which is a noddle-based broth with slices of beef in, which was delicious. We washed them down with a 1lt of beer served in an aluminium container, which seemed to last forever when pouring it! More rain seen us hide again and do more blogging/photos and we only ventured out for food at night, but to be honest there isn’t much else to do in Tam Coc, and probably 2 days would have been enough there in hindsight. We had a fairly early night as tomorrow we were catching another train up to Hanoi, a far shorter 3 hours this time though!